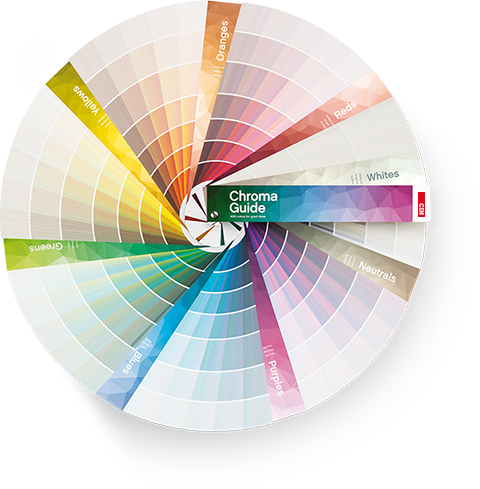 CHROMAGUIDE offers a range of 1650 colours carefully selected and classified in a user-friendly way. The collection of whites is presented in samples with an extra-large dimension (4 per page) in order to improve visualisation of the colour. 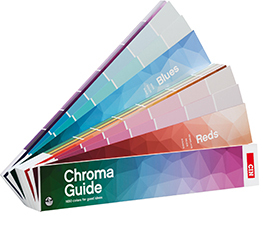 The remaining CHROMAGUIDE colours contain 7 samples with the same hue, from the lightest to the darkest. ChromaGuide is composed of 8 tabs that make it easier to select the colours, making their identification simple and intuitive. It is very easy to locate any colour in the fan deck! Each chromatic group is represented by a letter. As an example, how would you locate the colour 03R4 on CHROMAGUIDE? The first element to analyse. It corresponds to the chromatic group; in this case, it’s the group of reds. It corresponds to the page number in the reds tab, page number 3. It corresponds to the position of the colour on the page. In a format that allows you the most straightforward and convenient use in professional situations. Next you will receive our contact to confirm the request. With tear-off sheets for more specialised and detailed use in professional projects. Specifically designed for this industry, CHROMAGUIDE makes available 1650 colours, studied in depth to meet the high level of quality required of an interior paint. CHROMAGUIDE is the reference colour tool developed for professionals of the painting industry. As a result of a combination between experience in colour and state-of-the-art technology, CHROMAGUIDE offers a complete range of colours covering all types of hues, luminosities and saturations. The 1650 colours were especially optimised for use on walls, accompanying the most recent and current trends in architecture and interior design. While developing the tool, we were particularly attentive to the sets of colours which are picked more frequently, namely the nuances of whites and neutral colours. The format of the colour samples, which was also extended in this tool, accounts for a better and more precise visualisation of all the nuances, thus improving the visual comfort for all users. In an industry which is in constant mutation, the expertise of the professionals should nowadays be integrated in everything in the process of choosing the appropriate colour. CHROMAGUIDE is distinguishable for its own particular and complete system which will support you on every project. As part of a study conducted by our Research and Development Centre, the CHROMAGUIDE colours were specifically refined for CIN resins, pigments and colorants. CIN’s recognition in the market is mostly related to the continuous investment in high-quality and modern raw materials. 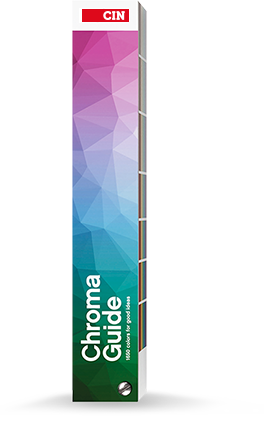 CHROMAGUIDE colours are exclusively available in the Colormix tintometric system, thus guaranteeing a high level of quality and reliability. The performance of the CHROMAGUIDE colours is obtained through a perfect mastering of the design momentum and study of the paint, excellence in raw materials selection, combined with the quality of the Colormix system and its strict control and regular maintenance. The colour here represented provides the user with a better visual and guiding selection. CIN has made every effort to ensure a faithful reproduction of the colours available in this catalogue. However, due to technical printing limitations, the colours may slightly differ from the original colour. Therefore, we recommend a test of the colour on the surface to paint before any final application. The perception of the applied colour may vary slightly depending on the nature of the surface, lighting and conditions of the space, texture/brightness of the product, size of the area and the number of coatings. Some of the brightest colours are more transparent and may need more coatings in order to obtain the desired level of opacity. CIN has no influence on the choice, selection and application of colour, therefore, any responsibility is dependent of the respective users. Extended exposure to sunlight/solar rays, variation of temperature and humidity, as well signs of wear and natural handling, may change the hue of the colour. These changes are more visible in light colours. For those reasons, we recommend you to keep your CHROMAGUIDE in a dry place, away from solar light and heat. This guide should be replaced from time to time to maintain reliability of the colour. 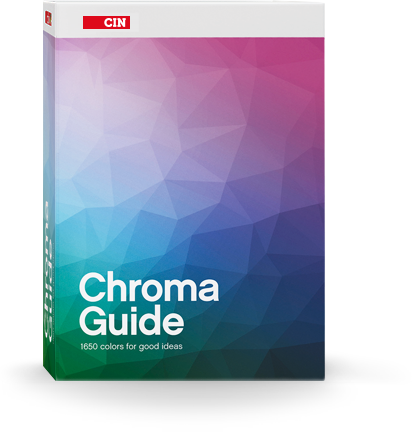 CHROMAGUIDE is a colour guide property of CIN. This tool may only be used with CIN products. 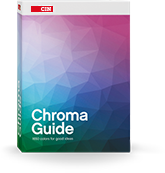 The use of CHROMAGUIDE is exclusively allowed for specifying and/or for colour preparation of products manufactured by and/or supplied by CIN.